If you are ready to hike, bike, swim, and dive while honing your academic skills, this is the program for you. The adventure starts in Sydney where you jump into a wetsuit and learn to surf on Australia’s famous Bondi Beach. Each place we venture into will lead you to push yourself physically and mentally as you discover some of the most incredible places in the world. 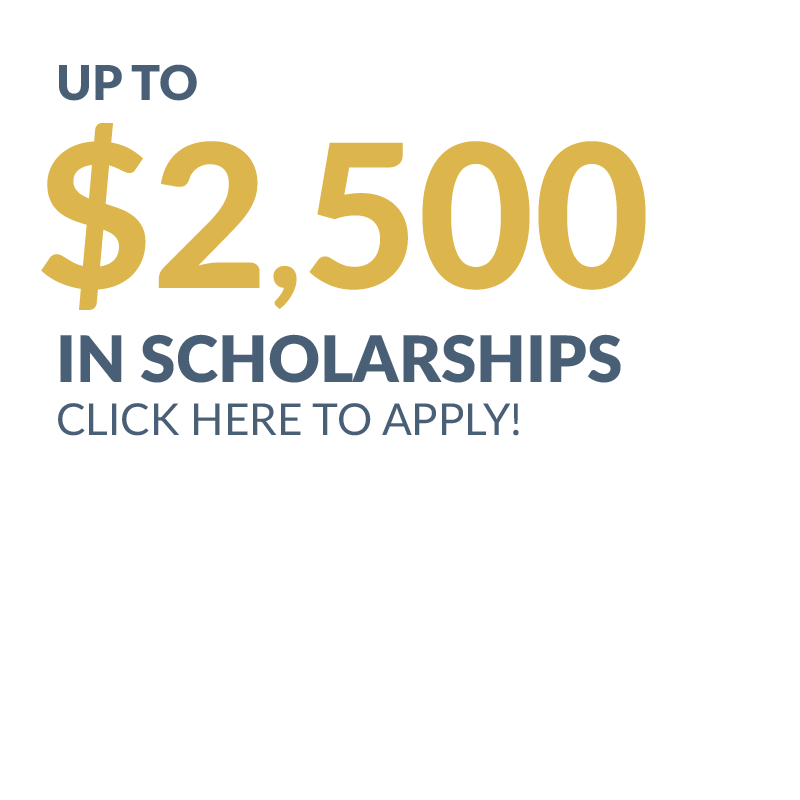 The literature, discussions, and debates you have on this program will inspire you to find your core strengths and nurture your leadership potential. There is no better way to grow your GRIT than to work out every day for 50 days with a like-minded crew of adventurers. If you’re up for the challenge—we welcome you to join us. My Adventure Down Under was the most unforgettable experience of my life. I was very fortunate to receive by far the best education and one-on-one teaching I’ve ever had, not to mention the bucket list adventures I experienced. It was something special to scuba dive in the Great Barrier Reef and climb the breathtaking views of the Blue Mountains, all the while being surrounded by people who all felt like family within days. Those bonds will last a lifetime. It didn’t feel like the regular “classroom” learning here. I was an avid and motivated student; more than ever I wanted to listen and be taught. What I was learning here was tangible and exciting. The challenges I was faced with are something I can be proud of overcoming. I will hold my MEI trip close to my heart for the rest of my life. Our academic adventure in Australia and Bali commences in Toronto, where teachers and students get to know each other and settle into the rhythm of the program. There, we conduct activities and complete foundational course material before setting off for Bali. All of our preparation allows us to hit the ground running and dive straight into the adventure that awaits. 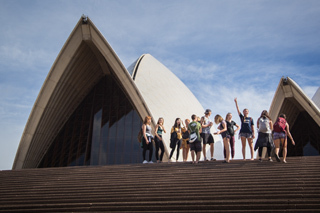 Our first stop down under is Sydney, where students are immersed in Australia’s thriving economy, set against a backdrop of breathtaking mountains and golden beaches. Students hit the ground running, utilizing the upscale harbourfront district as their home base. Here, we trace its humble beginnings as a settlement for convicts to its current status as the epicentre of one of the most dynamic cities in the world. Beach volleyball tournaments, surfing lessons, and Ultimate Frisbee games on the white sand of Bondi and Manley Beaches fill our days. 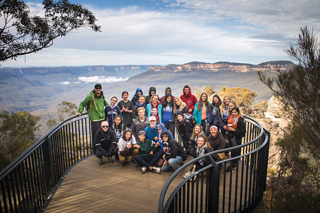 Before boarding a flight to Queensland, students enjoy a three-day trek through the eucalyptus forests of the Blue Mountains, a UNESCO world heritage site, that connects body and mind. Known for its dramatic scenery, the Blue Mountain area allows students to view steep cliffs, eucalyptus forests, waterfalls and villages as they hope to spot koala and other wildlife. Travelling south along the eastern coast of Queensland, we visit the Sunshine Coast of Australia. In addition to the endless and breathtaking white sand beaches, the Sunshine Coast is also home to national parks, universities, and award-winning international cuisine. Students have an opportunity to explore local conservation efforts, while also preparing for tournaments and leadership competitions. 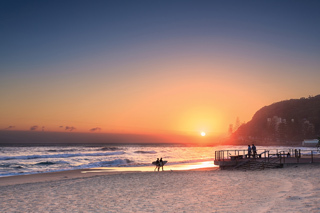 Packed with easygoing cafes along the water, the Sunshine Coast is also the perfect location for students to delve into essay writing and experimenting with developing their voice. 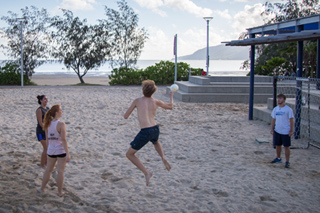 In Cairns, days are spent focusing on academic writing and the development of a compelling thesis, while evenings are spent along the esplanade, tossing Frisbees and playing beach volleyball, before cooking group dinners back in our cozy apartments. Our time in Cairns concludes with a three-day excursion to the spectacular Great Barrier Reef on a private liveaboard boat. 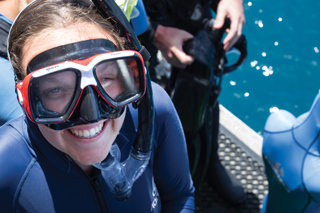 There, students discover the hidden nooks of the coastline while scuba diving and snorkelling in search of clownfish, reef sharks, and sea turtles. 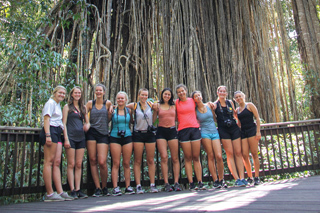 Back on land, students ascend to the tropical heights of the Atherton Tablelands on the north-east coast of Queensland. An adventurer’s paradise, we explore the local lakes, waterfalls, and rainforest. Our cozy accommodation offers the best of Australian hospitality, and an optimal location to examine the beauty of this Wet Tropics World Heritage Area. 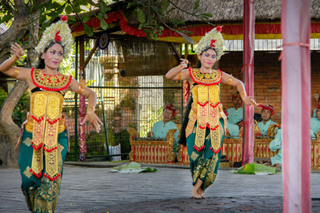 We then fly to the tropical paradise of Bali, Indonesia. Flying into Denpasar, students decompress from their journey along the beach-lined coast. Residing in Canguu, an economy driven almost entirely by its visitors, students examine the far-reaching effects of travel, tourism, and globalization. Our days are spent exploring the island teeming with kingfishers, wild orchids, and monkeys, while our evenings are spent engaging in BookChats over bowls of fresh curry and grilled seafood. From Canguu, we travel northeast to the nearby city of Ubud, where our exploration of emerging markets continues along the Tegallalang rice terraces, in the Monkey Forest, and at the Goa Gajah ‘Elephant Cave.’ Here, students write their final exams and afterwards, they celebrate their journey as they conclude their adventure through Oceania. On their last evening together, students reminisce over dinner and prepare for their flight home.